In the second part of our feature on pigmented skin lesions, dermatology specialist Dr Sweta Rai describes the steps to rational decision-making in primary care and looks at malignant melanoma. How long has the lesion been present? Congenital melanocytic naevi (CMN) are present from birth. However, most moles are acquired de novo in childhood or early adult life, therefore new moles occurring later in life (i.e. above the age of 40) should be treated with caution. Has it changed recently? Melanocytic lesions may change gradually over years in tandem with the patient’s growth. If a ML changes rapidly – that is, over a few weeks or months without any other contributing factors – this should raise concern. Has there been any change in size? If a ML grows two or more times its original size over a period of few weeks or months, this may be a sign of abnormal melanocyte proliferation and should raise alarm. Has the shape changed? Melanocyte proliferation in malignant melanoma occurs in a disorderly manner, which may present clinically as an irregularly shaped mole and is often asymmetrical. Has the colour of the mole changed? Both atypical or dysplastic naevi may have different shades of colour ranging from red to brown-black and are usually less than 5mm in size. When moles change in colour over a short period of time and display areas of noticeable dark brown or black pigment, which is out of keeping with the patient’s other moles, this may signify malignant change. 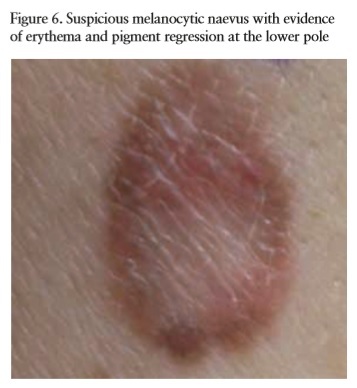 The loss of pigment within a mole – so-called ‘pigment regression’ – may also be a concerning feature (see Figure 6), although this should be distinguished from the slow steady uniform loss of pigment which occurs as benign naevi ‘mature’ or dermalise over time. Partial regression of a mole may be a feature of primary malignant melanoma and results from the body’s immune response to invasive melanoma cells in the vertical growth phase. Complete regression of melanoma is a rare though recognised phenomenon. The differentiation of loss of pigment in benign dermalising moles from regression of pigment is demonstrated in Figure 6. Has the mole been itching or bleeding? Moles may bleed for various reasons, such as external trauma, or itch if inflammation occurs around a hair arising within the mole. This is particularly so if the naevus is on a site where it might be irritated, such as the hairline and scalp (from brushing hair), the neck and wrists (from jewellery, collar or cuffs) or the torso, waistband or groin (from brassieres or underpants). When moles itch or bleed spontaneously with no apparent external causative factors and have changed in appearance, they warrant further evaluation. When clinically evaluating a mole, the ABCDE mnemonic (see below) may be useful in highlighting ‘red flags’. Diameter: The size of a mole should routinely be documented by measuring the vertical and horizontal diameters in millimetres. If a mole grows over a period of time this can then be objectively assessed by this method and suggests melanocyte proliferation. A growing melanocytic lesion out of synchrony with the patient’s growth is concerning and should prompt referral to specialist services. Melanoma may be of any size although changing lesions greater than 5mm should raise concern. Evolution: Any lesion, which is quickly evolving or changing should be treated with suspicion. Similarly any new or changing lesion that is unusual or cannot be given a name should be considered for referral. The justiﬁcation for this is that although most melanomas are of the superﬁcial spreading type and have the typical changes of irregularity of shape size and colour, nodular melanomas may be symmetrical and non-pigmented and could be misdiagnosed as a pyogenic granuloma or a non-melanoma skin cancer. If in doubt refer up under the two week wait rule. Surface ulceration : The presence or absence of surface ulceration is also worth noting when assessing a ML, as this holds prognostic value if conﬁrmed to be a melanoma. Most melanomas will display one or more of the above features of change. If one or more high risk factors are present in association with concerning findings on examination, then an urgent referral to secondary care should be considered. It is worth noting that melanomas are more common in fair skinned individuals, particularly in those of Celtic descent. Melanoma is rare in Asian and Afro- Caribbean skin, although acral lentiginous melanoma (palm and sole and nail melanoma) occurs in all ethnic groups. After the completion of a tailored history the ML in question should be examined. A thorough clinical examination includes inspection and palpation in most cases. A total cutaneous examination (TCE: patient undressed down to their underclothes) is gold standard for the evaluation of moles, especially with one or more of the above risk factors. Atypical moles in particular warrant a TCE to evaluate their abundance and range of atypia. This may facilitate the timely detection of melanoma. 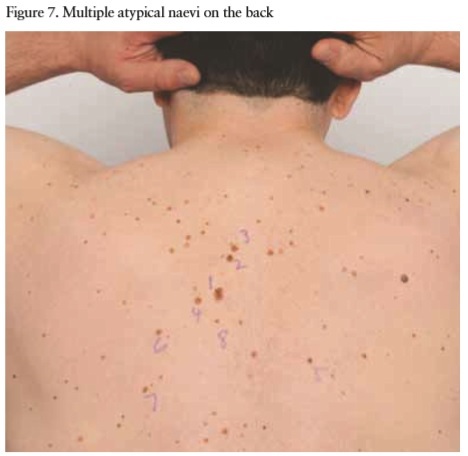 While it is not always necessary to perform a TCE, especially if the presenting ML appears banal, thorough examination is advisable if the patient has multiple moles (see Figure 7) or has an atypical mole with a previous history of melanoma. 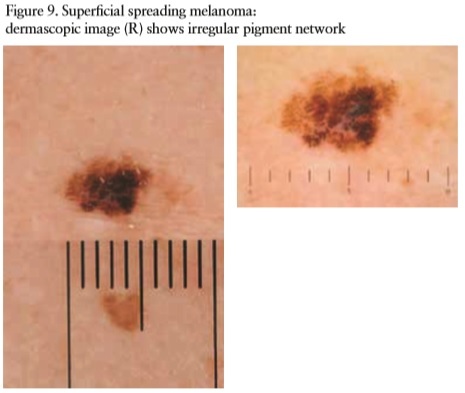 Superficial spreading melanoma (SSM). This is the commonest subtype, accounting for almost 70% of all cutaneous melanomas. It usually displays a radial growth phase, characterised by a horizontal growth pattern, predominantly within the epidermis. This subtype carries less invasive potential in comparison to vertical growth pattern. Both patterns however are possible in SSM, and this subtype typically exhibits change in shape, size and colour (Figure 9). Nodular melanoma (NM). This subtype occurs in 15-30% of patients and exhibits a vertical growth phase, hence possessing higher metastatic potential. These are less likely to display typical appearances of changing size, shape and colour, and may commonly be misdiagnosed as pyogenic granuloma, basal cell carcinoma, or even angiomas. Acral lentiginous melanoma (ALM). This is a rare form of melanoma accounting for 2-8% of MM cases. These melanomas occur on the palms, soles or under the nail plate (subungual variant, characterised by Hutchison’s sign, where pigment spill is noted across the proximal or lateral nail fold and may be associated with nail dystrophy). Although rare, this form is the most common form of MM in dark skinned individuals. 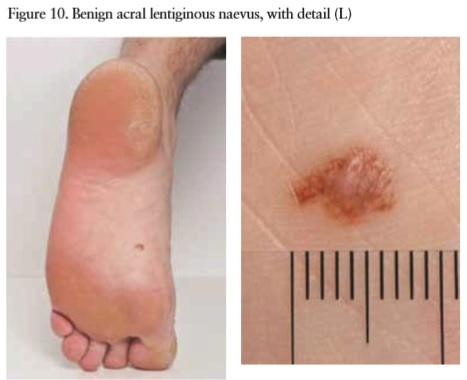 Figure 10 shows a benign acral lentiginous naevus. Lentigo maligna melanoma (LMM). This occurs typically on the head, neck and arms in over 65 year olds with chronically sun damaged skin. The in situ precursor lesion is usually large (>1- 3cm) and is termed lentigo maligna. LMM may vary in colour from light brown or red to black. Histopathologically, the atypical melanocytes track down adnexal structures, i.e. hair follicles, and background solar elastosis is invariably notable. Amelanotic melanoma (AM). This variant is extremely rare and constitutes less than 5% of all melanomas. AM usually presents as pink to flesh coloured nodules, mimicking basal cell carcinoma, squamous cell carcinoma or even a dermatofibroma; however the history of rapid evolution or change would suggest AM. The melanocytes in AM are poorly differentiated and lack the ability to synthesise melanin, thus leading to its amelanotic appearance. Desmoplastic melanoma (DM). This is another rare variant, which clinically resembles non-melanoma skin cancer and presents as a firm flesh coloured nodule, or in association with a patch of lentigo maligna, typically in older patients. DM lesions exhibit greater risk of local recurrence and perineural invasion and are therefore treated more aggressively. 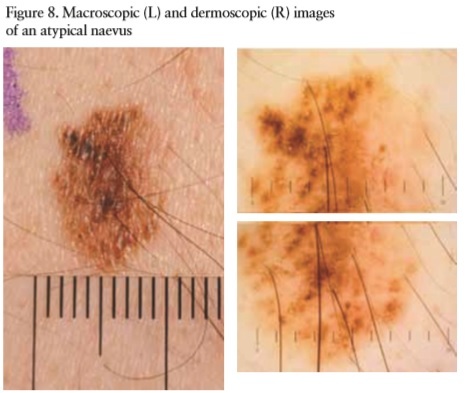 The use of a dermatoscope is a helpful tool in the identification of melanin and its pattern of distribution and therefore in the early detection of melanoma. 5 Special training in the use of a dermoscope is required and beginners may have a higher false positive referral rate. Developing experience with its use, however, may convert this into an invaluable tool in the differentiation of benign from malignant lesions and identification of melanoma. It is an essential tool for the dermatologist. Once confronted with an atypical PL or a suspicious PL the next step for the GP is to refer to a local dermatology service for specialist evaluation. The route of referral depends largely on the degree of suspicion regarding the PL in question. For a ML with definite suspicion of melanoma a two week cancer referral should be made to a local dermatology service. Differing systems are in place to facilitate urgent review of PL, which is region specific; however, most dermatology services have specific cancer waiting target forms, which require completion. Once a suspicious ML is referred via the fast track cancer target pathway, the patient should receive an appointment to see a dermatologist within two weeks of their referral. If the lesion is deemed suspicious for melanoma then their initial treatment – a diagnostic excision biopsy with 2mm margins – is usually performed by a dermatologist within 31 days of the confirmatory diagnosis being made, and completion of treatment should be achieved within 62 days of confirmed diagnosis. If the excision biopsy is confirmatory of a melanoma then staging is done within a specialist skin cancer multidisciplinary team, involving dermatologists, dermatopathologists, specialist skin cancer nurses, plastic surgeons, medical oncologists and radiologists, where further management of the melanoma is planned. This usually involves further wide local excision of the melanoma scar site and if indicated further sentinel lymph node biopsy and scans, depending on the stage at presentation. If there is uncertainty about the exact aetiology of a ML, further referral to secondary care may be discussed with a local dermatologist or melanoma expert. The duration of waiting times for such referrals is variable from weeks to months, and it is worthwhile enquiring about these and informing patients in turn. For patients with less concerning moles, where a degree of uncertainty regarding diagnosis exists, routine referrals may be considered. Most regional centres run specialist pigmented lesion clinics at least once a week for evaluation of PL, and timings and referral methods can clarified by liaising with the local skin cancer lead for melanoma or the skin cancer multidisciplinary team coordinator. The treatment of a melanoma is largely dependent on the stage at presentation. The revised UK guidelines for the management of cutaneous melanoma uses the American Joint Committee on Cancer(AJCC) staging system for cutaneous melanoma and outlines stage specific treatment. 6 Novel mutations in cutaneous melanoma have been found – namely BRAF, NRAS and KIT – and new drugs targeting these mutations have revolutionised the treatment of metastatic melanoma. Melanomas arising on intermittently sun damaged skin tend to be associated with BRAF mutations, with melanomas arising on chronically sun damaged skin exhibiting NRAS mutations and non sun exposed skin, such as acral and mucosal sites, more frequently exhibiting the KIT mutation. 7 It has become routine practice across many centres in the UK to test for the BRAF-V600E mutation in cases of metastatic melanoma, i.e. stage IV disease. If the mutation is found, a BRAF inhibiting drug such as vemurafenib may be given after patient counselling. vemurafenib has been shown to increase tumour progression free survival (PFS) by 5.3 months and overall survival by 6 months. A trial comparing vemurafenib with dacarbazine demonstrated 84% survival in the vemurafenib group in comparison to 64% in the dacarbazine group at 6 months. 8 Research is ongoing in the management of melanoma, and targeted therapies and vaccines are undergoing evaluation. Since no definitive screening programme exists in the UK for melanoma skin cancer, it is vitally important to detect atypical ML early and appropriately refer these to the local skin cancer multidisciplinary team where both effective and timely management of these lesions can be performed. Having a simple yet effective method for the evaluation of ML, which can be easily reproducible, is essential to early melanoma detection. Most patients can be taught how to self examine their skin for change in their moles with the ABCDE technique. High-risk patients should be advised to do this on a monthly basis. For sites such as the back, which are difficult to visualise, a partner, friend or family member may be recruited for regular assessment. Early detection of melanoma and minimising risky behavioural patterns may be lifesaving and therefore should be the focus point for all those involved in evaluating a ML. For further information on the evaluation of melanocytic and other skin lesions the GP skin cancer referral toolkit is an invaluable resource and available at www.doctors.net.uk. 9 Further information on mole assessment (clinical and dermoscopic) and melanoma can be found at www.genomel.org. 5 M.E. Vestergaard, P. Macaskill, P.E. Holt et al; Dermoscopy compared with naked eye examination for the diagnosis of primary melanoma: a meta-analysis of studies performed in a clinical setting; DOI: 10.1111/j.1365-2133.2008.08713. 8 Chapman PB, Hauschild A, Robert C, et al. N Engl J Med . Jun 30 2011;364(26):2507-16.